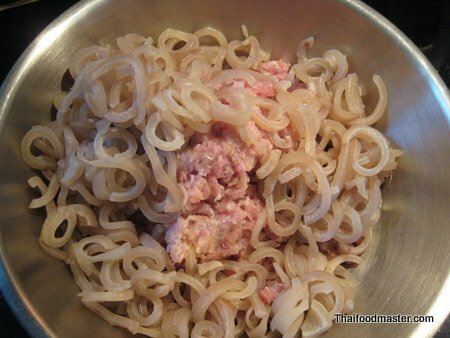 Search the luggage of a Thai person traveling abroad, and it’s highly likely that you’ll discover various items of food. Rolled in a newspaper or a piece of cloth, hidden deep in their bags, few Thai students will venture forth without a jar of their favorite roasted chili jam, while Thai housewives are often accompanied by their preferred brand of fermented shrimp paste. Both are probably carrying a couple of fermented Thai sausages as well. 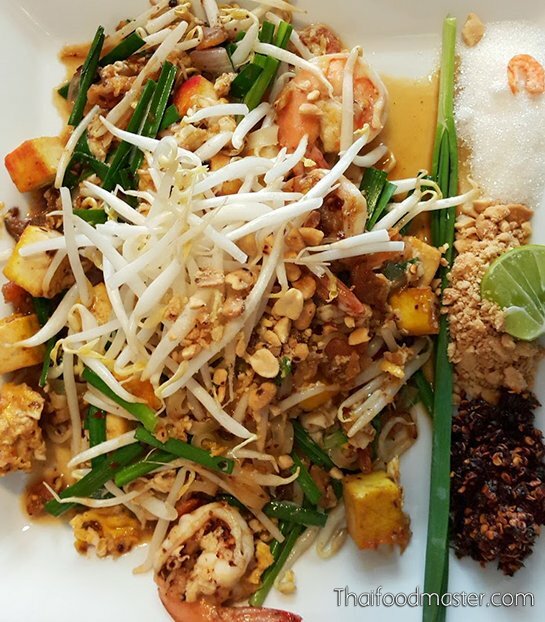 You see, the intense and defined flavors of Thai cuisine – harmonically coming together to create a rich whole – are simply irreplaceable. Thai people will not survive happily without their beloved Thai food. Naem is usually eaten with sliced ginger, chopped shallots, peanuts, bird’s eye chilies and spring onions. The fresh shallots give the dish a sweet heat that harmonizes well with the sourness of the naem. Naem is also used in many recipes. Some of the more well-known include fried rice with naem, and naem fried with eggs. 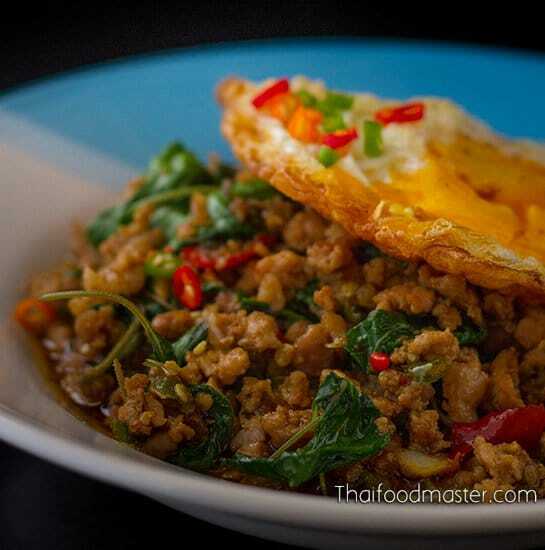 Whether enjoyed on their own, or used in cooking, Thai sausages are packed with flavors! 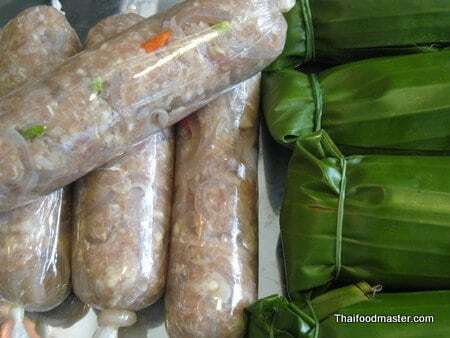 So, for you – Thai people living abroad – and also for you – the lover of Thai food – I present this step- by-step tutorial on how to prepare a homemade fermented Thai sausage. Naem is a fermented sausage made with pork, pork skins, cooked sticky rice (glutinous), fresh garlic, salt, sugar and bird’s eye chilies. The sausage is wrapped in banana leaves or synthetic casings, and fermented for 3-5 days at about 30 degrees (C) and 50% humidity. The fermentation process enables the growth of lactic acid bacteria and yeasts, mostly lactobacilli, which accounts for the sourness of the sausage. The salt acts as an inhibitor - preventing the meat from going rotten, allowing the lactic acid bacteria and yeasts to feed on the rice and sugar, and fermenting the meat to perfection. Trim and discard the fat from the pork, leaving only lean red meat. Mince the pork meat. 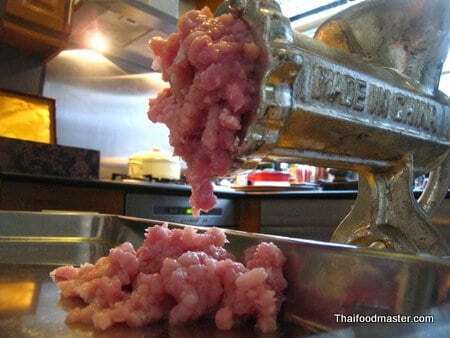 I use an old-fashioned heavy duty manual meat grinder to do the job, and rarely rely on the butcher for help. 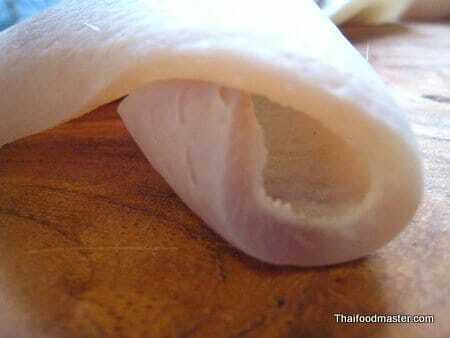 Clean the pork skin by rubbing it vigorously with rough sea salt and white vinegar. Wash with running water. Repeat as necessary until the skin is clean and smooth. 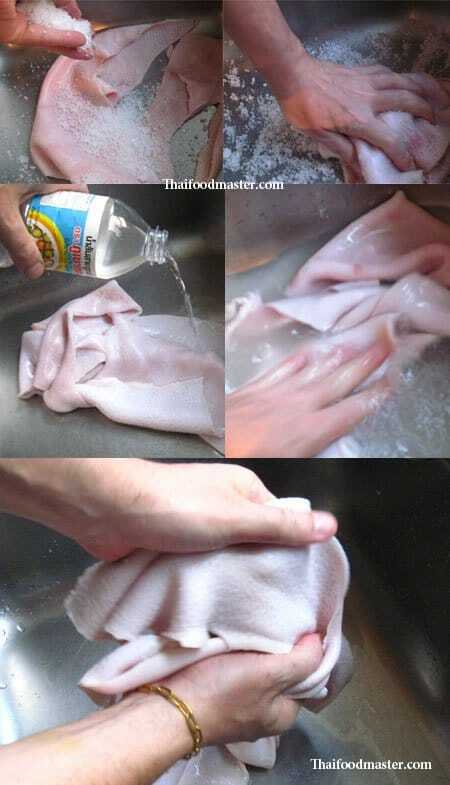 Cook the skin in boiling water until the skin become transparent and breaks easily when pinched. This can take up to 40 minutes. Shred the skin into thin strips of approximately 2 mm wide and 4 cm long. 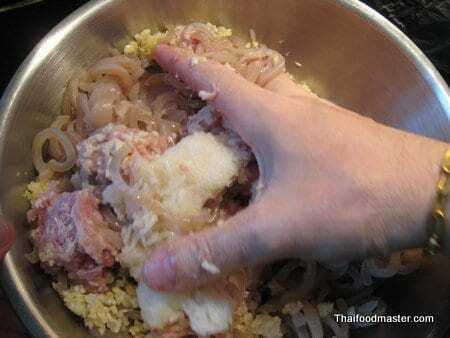 In a mixing bowl combine all the ingredients: the pork meat, skin, garlic, rice, salt, sugar and MSG. Work everything with your hands until the mixture is well and evenly mixed. 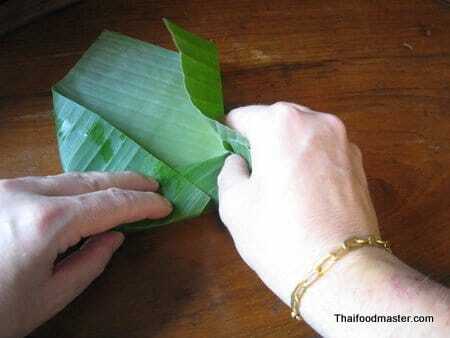 Depending on the size of the sausage you are making, arrange the pork mixture on one corner of a 20 x 20 cm banana leaf. Top with bird’s eye chilies, and roll as shown in the photo. 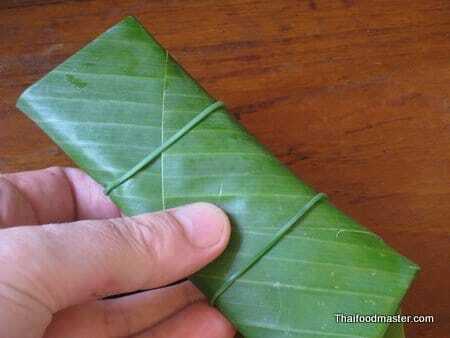 If you do not have access to banana leaves, you may use plastic wraps to encase the sausage. Allow to ferment for 3 to 5 days at about 30 degrees C and 50% humidity. I found out your site from my friend… It is really nice one. I will try this Sausage Recipe soon. I did it. It was successful, I think. Thanks again. Great! And now, I would like to make yam naem :) which I ate at the so called Thai park in Berlin, Germany, never in Thailand – so far. 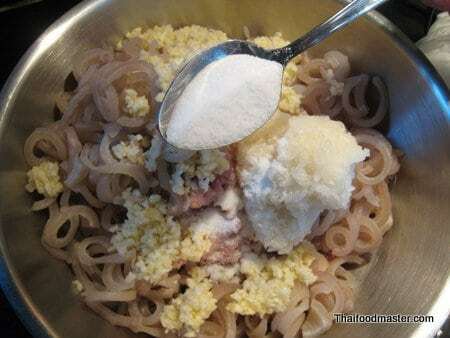 Would you post your recipe for this dish? Would be nice! I will have to try to make this. Thank you so much for your affords and the knowledge you share here with us. I am really a big fan of yours. We plan to make Lod-Chong when my boyfriend is here. I used regular salt insted of sea salt. Does it make a difference? Also, it doesn’t have that pinkish color. Why is that? The nam powder I used before has a small packet of red salt and it males the nam pinkish red.Where can I buy red salt? Any salt will do Jay. Actually in the northern east part of Thailand (Isaarn) they use mined underground salt. So no worries about that. As for the red color, homemade naam is not as red as the commercial product because you don’t add coloring agent like the factories do. its only a matter of food color. Hi, when do you know when the meat has fermented enough to eat? Thanks! I’m excited to try this recipe! asa, after 3 days its starts to taste sour, providing it was kept in the right temperature, than it turns sour, and ready. let it sit longer and it become more sour, a matter of taste. Thank you for putting this together. What a great idea! I was searching for a simple recipe for naem and found much more on your site. The recipe with photos makes replication much easier. 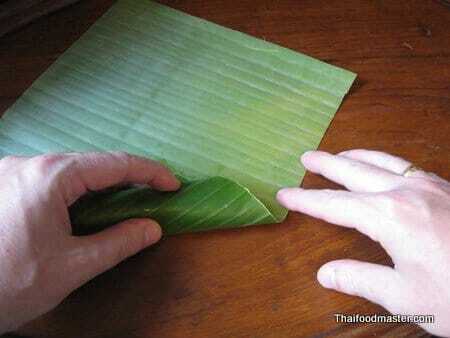 Is there a difference in the curing process whether you use plastic wrap or banana leaves? Is one better? I’m going to have a crack at this from the UK. Garlic cloves here are much bigger than Thai garlic cloves. 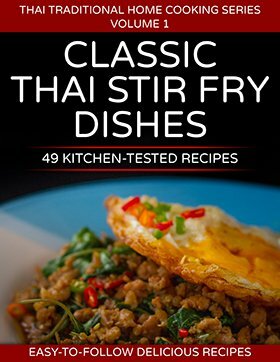 Does the 25 cloves in the recipe assume Thai garlic? i.e. should I reduce the amount of cloves that I use. 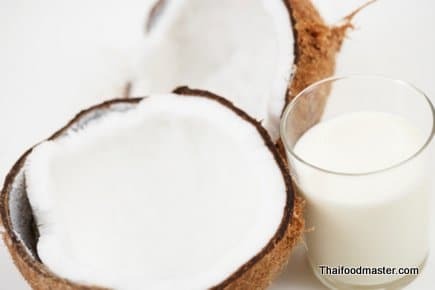 This article makes no mention of the numbers of Thai people who get food poisoning from this and many other “Thai delicacies”. It is one of the main reasons for admission to the hospital I work in. Please make sure that people understand they must be careful what they are doing. Many years ago I worked in a custom slaughterhouse in Tennessee where an elderly Lao man (Mr. Bingey – probably spelled wrong) would occasionally drop by for parts of the animals that are usually thrown away in America. He made the best tripe soup I ever ate but his fermented pork sausages were absolutely awesome. Rather than just using pork skin he preferred using thinly sliced pieces of ear and since you never knew which bite would contain the small but very hot chili we called his offering “pig ear surprises.” I never drink a beer in the summer without thinking how pleasant it would be to have a “pig ear surprise” to accompany it. I was saddened when Mr Bingey moved away but his delicious food has not been forgotten. Hi Charlie, pig ears are a great treat, the cartilage is soft and crunchy and would definitely give a great texture to naem. Hi, thanks for the recipe, it looks delicious. I am allergic to MSG, will it be a problem if I leave it out or is it necessary to the fermentation process? Thanks so much! 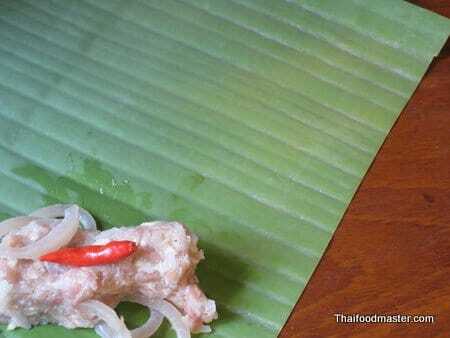 Hi, I was wondering if the sticky rice is necessary for the fermentation process? Hello Dylan, The rice introduces yeast and bacteria that creates this specific fermented pork product. the book “Indigenous Fermented Foods of South Asia” is a good reference if you wish to learn more. Can I eat this raw? the fermentation produce lactic acid which “cook” the meat and making it safe to eat, you can either eat it “raw” or cook it. Out of curiosity, could I just pack the meat into a tupperware container and leave it out like that? or does it have to be in sausage form? Also, if I do use banana leaves, would I then put the banana leaf wrapped sausage into a ziplock bag, or just leave them out in just the banana leaf? of course, the meat can also be fermented in blocks. Sorry, for the second comment, but what exactly do you mean by sticky rice. I live on a small island and don’t have many rice options. Will regular rice work? sticky or glutinous rice is a type of rice which is especially sticky when cooked. use regular rice if you can’t get it for the same results. Hi – prague powder #2 is only used in long cured meat like salami that takes weeks or months. Prague powder #1 (another pink salt nothing to do with Himalayan salt ) is used for quick cures like naem. It makes the cured meat safer , and makes it look nice and pink, rather than grey . That is through an interaction with a protein, nothing to do with the pink dye added so it isn’t confused with normal salt. That’s why people think that some food colouring has been added to commercial meat products. I use prague #1 so I can extend the curing process in a safe way (and get them really sour), but it isn’t necessary (or recommended to eat a lot).